Pupusas are an easy recipe to make at home. 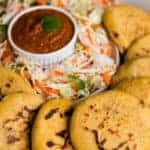 These homemade traditional Central American pupusas have a thick corn tortilla stuffed flavorful red beans. Heat vegetable oil in large nonstick skillet over medium high heat. When hot, add the minced onion. Allow to brown and stir only to prevent burning. 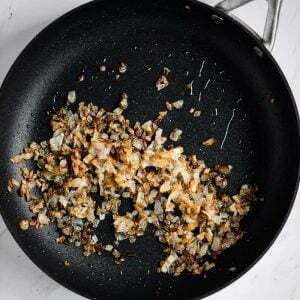 When onion is brown and fragrant, scoop out onion with a slotted spoon and allow to cool on a paper towel lined plate. Combine cooked and cooled onions with refried red beans and cheese in medium bowl. Set aside. 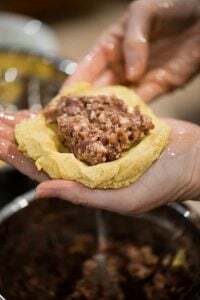 To make the pupusa dough, use a stand mixer fitted with the paddle attachment and beat masa flour, salt and hot water on medium speed until dough is very thick and sticky. Mix for about 5 minutes until light and fluffy. Allow dough to rest, uncovered, 15 minutes. Combine remaining oil and warm water in a small bowl. Dip both hands in this mixture and rub your hands together to coat. 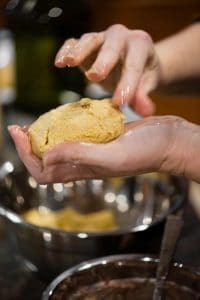 This will prevent dough from sticking to your hands, and will hydrate dough as you assemble. 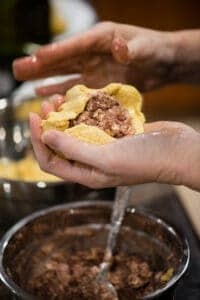 Add some dough to the palm of your hand and flatten. 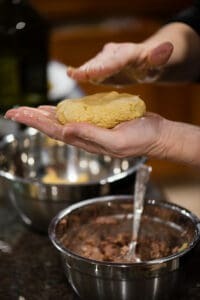 Add a scoop of the bean mixture to the center. Pull up sides of dough and pinch dough around filling to enclose. Add extra dough to patch any holes, if needed. Gently flatten into a disk. Repeat with remaining dough and bean mixture (I ended up making 8 pupusas that were about 5 inches in diameter). Heat nonstick griddle over medium to medium high heat and cook for about 5 minutes on each side until cooked thru and starting to darken. Serve hot with Salvadoran Curtido cabbage slaw and Salvadoran Salsa Roja alongside.